Christ the Redeemer is an imposing statue of Jesus Christ that overlooks the city of Rio de Janeiro in Brazil. It has become an iconic symbol of the city and of Brazil and one of its more popular landmarks. This imposing statue of Jesus Christ is also considered as one of the tallest of its kind in the whole world, with the Cristo de la Concordia in Bolivia the only other taller statue. 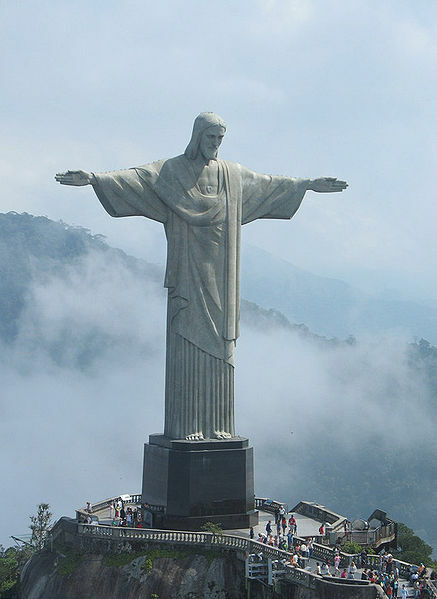 The Christ the Redeemer statue stands 38 meters or 120 feet tall, 30 meters or 98 feet wide and weighs around 635 tons. It is situated at the peak of the 700-meter Corcovado Mountain in the Tijuca Forest National Park, further adding to its imposing profile. The statue is primarily made out of concrete and soapstone. The idea for putting up a statue on top of the Corcovado Mountain was first heard sometime during the 1850’s. The first proposal was given by a Catholic priest by the name of Pedro Maria Boss who requested for financing from Princess Isabel to build a large monument. The proposal was rejected. The second proposal to build the landmark on top of the mountain was made sometime in 1921. A fundraising was organized with the money started coming from the Brazilian Catholics. There were many ideas suggested for the said statue of Jesus Christ. But the statue of Christ with arms wide open was the one chosen. The statue was designed by a local engineer, Heitor da Silva Costa and was sculpted by French sculptor Paul Landowski. Engineers studies the sculpture made by Landowski and proceeded to build the statue out of reinforced concrete instead of steel, with concrete being more suitable for such a statue with wide open arms. The outer layer of the statue is made out of soapstone, chosen because of its enduring qualities as well as its ease of use. The construction of the statue took nine years to finish. Initial work was done in 1922 and was finished by 1931. The huge monument took around $ 250,000 to build and was opened to the public on October 12, 1931.